Accessories: Accompanied by Roger Dubuis presentation box with outer packaging. 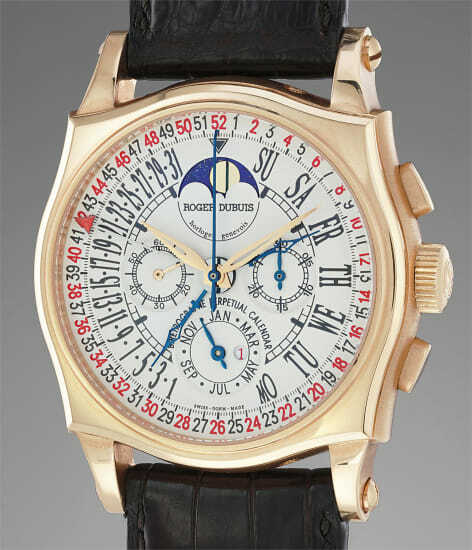 After a long stint at Patek Philippe, Roger Dubuis created his own eponymous brand in 1995. As an independent watchmaker he developed the “Sympathie” that was an audacious and innovative case design. The present Sympathie retrograde perpetual calendar stands out of the normal production by numerous point. The high end Lemania caliber, the same as the one powering Patek Philippe references 3970 and 5970, has been beautifully modified to display the retrograde calendar. Made in Geneva and thanks to the quality of this movement based on a profound respect for tradition, it has been granted with the Geneva seal. The large 43mm diameter distinctive pink gold case’s shape is unmistakable and the dial gives an impressive amount of information. In addition to the moonphase, this perpetual calendar shows the day, date, month, leap year and less usual, it even displays the week on the outer ring of the dial. This watch was released as a limited edition of 28 pieces. Brave, bold and technically sophisticated as the brand likes to define itself, this watch can be seen as the Geneva watchmaker's legacy.